The Tamron SP 45mm f/1.8 features Tamron’s Vibration Compensation (VC) system that offers up to 3.5 stops of image stabilization — enabling, in theory, sharp shots of relatively static subjects using shutter speeds as slow as ¼ second. Note that VC is only available in the Nikon and Canon versions of this lens, as it’s not needed in the Sony version (as Sony cameras offer camera-based image stabilization). Other features include Tamron’s USD autofocus motor for quick and quiet AF, as well as a minimum focus distance of just 29cm, with a maximum magnification of 1:3.4 at this setting. There’s also a focus distance window on the lens barrel, a minimum aperture of f/16, and 67mm filter thread. The Tamron SP 45mm f/1.8 weighs in at 540g. Optical construction utilizes 10 elements in 8 groups, including a low-dispersion element and two aspherical elements for enhanced image quality. We’ve put the Nikon version of this lens through the rigors of a DxOMark Lab test, so let’s see how it shapes up. Achieving an overall DxOMark Score of 37 points, the Tamron SP 45mm f/1.8 ranks a very respectable 21st place for all lenses tested on the Nikon D800E. Refining the criteria down to either 45mm or 50mm standard focal length lenses, the Tamron SP 45mm f/1.8 fares even better, landing in joint first place alongside the Nikon 50mm f/1.4D. With a light transmission of 2.4TStop, the Tamron SP 45mm f/1.8 doesn’t quite maximize its full aperture potential, however, with brighter viewfinders available on both larger-aperture 50mm f/1.4 equivalents, as well as the f/1.8G version from Nikon. So while the Nikon 50mm f/1.4D lens has better transmission and chromatic aberration scores, the new Tamron 45mm wins in the other lens metric categories, including sharpness. In fact, with 28 P-Mpix for sharpness, it’s way ahead of the 45/50mm competition, with its closest competitor the Nikon 50mm f/1.8D at 24 P-Mpix. 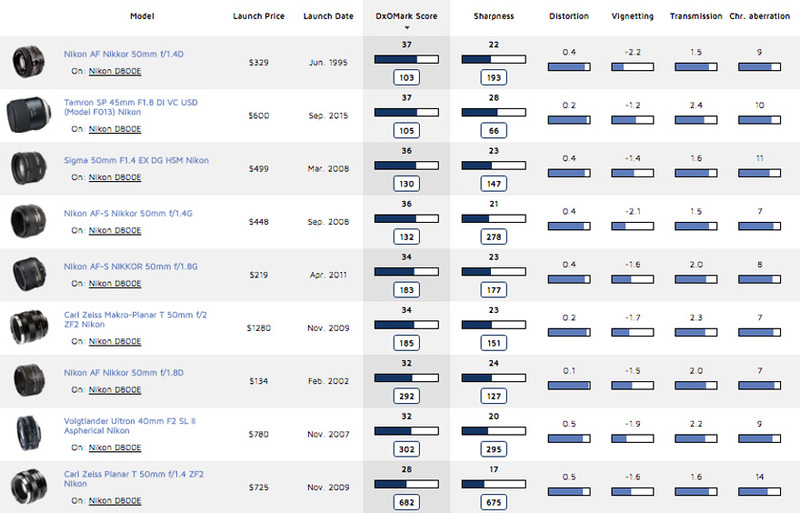 In terms of real-world results, that equates to excellent sharpness of over 65% at all aperture settings. Using mid-apertures between f/4 to f/8, the Tamron SP 45mm f/1.8 delivers its best sharpness of over 80% both in the corners and right to the edges of the frame. At the wider aperture settings of f/1.8 and f/2.8, again, the center of the frame is outstanding, with over 80% sharpness, and although it drops a little at the edges, it’s still very respectable. At f/16, diffraction results in slightly lower resolution overall, but it’s still homogenous across the frame and just into the green zone at around 65%. Finally, vignetting of –1.2Ev occurs at the widest f/1.8 aperture setting as the lens struggles to get the full transmission right into the corners of the frame. While resulting images at this setting will require correction in post-production, the problem is all but eradicated using aperture settings between f/2.8 and f/16. Tamron’s range of Superior Performance (SP) third-party lenses for Canon, Nikon, and Sony are really giving the own-brand manufacturers something to think about. Tamron’s latest SP 45mm f/1.8 standard focal length prime is no exception, delivering outstanding results across the board, and specifically for resolution, where its sharpness score of 28 P-Mpix on the Nikon D800E is ahead of the 50mm Nikkor competition. With an initial price tag of $599, it’s a little bit on the expensive side when you consider you can pick up the Nikon 50mm f/1.8G for less than half the price at $217, or a cheap bargain in the $132 Nikon 50mm f/1.8D. In fact, you can even get both Nikon versions of the 50mm f/1.4 equivalent cheaper at $269 for the 50mm f/1.4D or $447 for the 50mm f/1.4G, and give yourself an extra stop of light to play with. At 540g, the Tamron SP 45mm f/1.8 is on the heavy side, too, tipping the scales at almost twice the weight of the 280g Nikon 50mm f/1.4G. 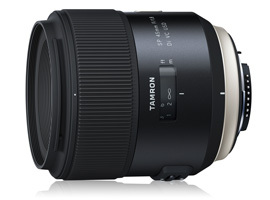 The Tamron SP 45mm f/1.8 is the first standard focal length prime to offer image stabilization, though, which could be a useful feature for many full frame shooters (and which goes some way towards explaining the additional weight). What’s more, with outstanding optical performance, and sharpness results that overall are ahead of the own-brand competition on the Nikon D800E, you get an awful lot of lens for your money.